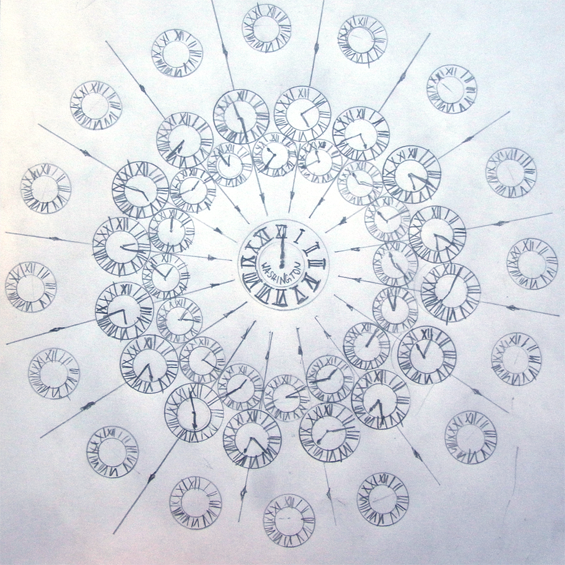 Drawing based on Johnson and Ward's diagram of time zones (1862). Yesterday at Share Conference 2 on the same stage gathered four persons who were introduced as futurists, foretellers and makers of the future. From left to right sat Khannea Suntzu, Rob van Kranenburg, Aubrey de Grey and Bruce Sterling. The panel was led by Vuk Ćosić. The first round was a warm-up, each of the futurists briefly presented his area of interest for tomorrow. Khannea Suntzu expanded on his idea of transhumanism, Rob van Kranenburg spoke about the Internet of things, Aubrey de Grey about the possibility to beat ageing and Bruce Sterling about the predictability of forecasting. The temperature of the panel rose glaringly when Vuk Ćosić ingeniously asked whom they consider their enemies, the counter-revolutionaries, the people who they will be fighting for the future. Santzu the other day talked about the development of singularity, the perfectly functioning A.I., which will be naturally financed and in service of the very rich people. That is to say that millions and millions of people will be substituted forever by intelligent machines which, among other powers, will be reproducing themselves. This is not a question of industrial revolution where men were already being replaced by more effecient machines. Santzu talked about permanent exclusion from the market of labour of a great part of humanity. It seemed a bit abstract because he was speaking about things which will take place around 2025-2030, and to short-sighted animals such as we are, it appears too far away. At the panel, to answer Ćosić question Santzu's did not hesitate too much. He was very straightforward and named Goldman Sachs. Aubrey de Grey spokea bout the “enormous preponderance” of people who are convinced that death will arrive at some moment, and who believe that there is nothing that you can do about it. At this point, Rob van Kranenburg intervened by saying how amazed he is about the people who in the villages just sit there on the benches, and “fade”. To this observation, de Grey cooly replied that he has at least a “million things to do”. It was nice to see multiple futures unfurling before our eyes, ones where people are content with the fact that they fade, and the other where there enjoy living in a sort of limbo. De Aubrey conclusion was that his principal enemy is first, past, and second, pyschology. Bruce Sterling instead opted to “name names”, or, as a matter of fact, a name. With great nonchalance and fervour at the same time, Sterling tackled climate change. The name which still so many people believe it does not exist or it does not happen. Instead, Sterling just “reminded” us that it is all around us, but that we “are free to lie to ourselves”. In case we were so oblivious, he gave us a few examples of “new” activities made possible by floods in Belgrade, such as surfing or canooing amids the city. Of course, nothing compared to New Orleans, but still illustrative. Sterling proceeded that many billionaires are very high on his black list, but these persons, and their corporations, will come and go, whereas the climate change will remain with us, it is our “heritage”. Sterling's final point was extremely engaging because we are often bound to think that these big problems, such as global warming, can be only resolved on international political congresses etc. But, his point was that it all is in our hands, not of anyone else. The sharpness of the ideas of every one of the “futurists” were so compelling that I bet no one in the Amfiteater of Dom Omladine could have remained indifferent. I believe that is because every one of them spoke about universal things. They superseded battles for the Internet, for copyright rights, etc., the battles which are certainly essential in the information era, and which make part of the things cited above. But, these thinkers went even further. But, they did not spoke about the future. Every one of them individuated things that are here now. Future-making starts from the present.